For other uses, see Slum. 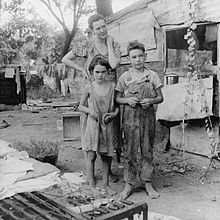 Shanty towns sometimes have an active informal economy, such as garbage sorting, pottery making, textiles, and leather works. This allows the poor to earn an income. 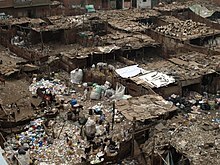 The above shanty town image is from Ezbet Al Nakhl, in Cairo, Egypt, where garbage is sorted manually. Residential area is visible at the top of the image. A shanty town near Cape Town, South Africa. These slums were built by the apartheid era government to segregate people by color and ethnic origin. 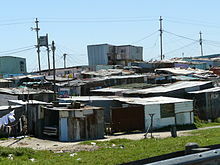 The above Khayelitsha Township is Africa's largest, with shanty homes served with disorganized electrical lines, with one shed showing a car parked inside. 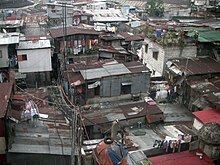 Shanty towns may be large or small settlements. Above shanty town is in Hong Kong. Shanty town along the Martin Pena Canal in Puerto Rico (1970s). Chabolas a plomo - shanty town perched on the side of a steep mountain in Latin America. Dharavi shanty town in Mumbai, India. A riverside shanty town near Dhaka, Bangladesh. ^ Jorge Hernández. "Sólo tres unidades de bomberos atienden 2 mil barrios de Petare" (in Spanish). ^ "ISUH home" (PDF). Retrieved 23 July 2015. ^ "People's Daily Online -- "Slums" sting Chinese cities, hamper building of harmonious society". Retrieved 23 July 2015. ^ Squires, Nick; Anast, Paul (September 7, 2009). "Greek immigration crisis spawns shanty towns and squats". The Daily Telegraph. London. ^ Fotheringham, Alasdair (November 27, 2011). "In Spain's heart, a slum to shame Europe". The Independent. London. ^ a b c "Some "Young Towns" in Lima Not So Young Anymore". COHA Staff. Archived from the original on 23 August 2011. Retrieved 23 July 2015. ^ Clarke, Felicity (May 16, 2011). "Favela Tourism Provides Entrepreneurial Opportunities in Rio". Forbes. ^ "Informality: Re-Viewing Latin American Cities". Retrieved 23 July 2015. ^ Thomson Reuters Foundation. "Thomson Reuters Foundation". Archived from the original on 16 April 2013. Retrieved 23 July 2015. ^ "Youth Bring Low-Cost Solar Panels to Kenyan Slum". Retrieved 23 July 2015. ^ "IT for schools, Schools, Education, Technology, UK news, Online learning e-learning (Education)". The Guardian. London. May 8, 2001. ^ "UN study says wealth gap in Latin America increases- A study by the United Nations suggests the gap between the rich and the poor in much of Latin America is widening". BBC News. August 21, 2012. Retrieved 6 January 2013. ^ a b "Dictionary: location". Oxford Living Dictionaries. Oxford University Press. ^ "Hutment". Free Dictionary. Retrieved April 6, 2013.